The Revised Gender Policy 2013—the controversial document which the church community has opposed on the grounds that its very language introduces “sexual orientation” clauses which run contrary to established spiritual norms in Belize and provisions which some fear could open the door for minors to seek abortions without parental consent—will be the subject of a review in July, by a steering committee to be headed by Prime Minister Dean Barrow, the Belize Association of Evangelical Churches has announced. The Belize Association of Evangelical Churches has said that prayer and dialogue are the more effective means of getting through to the Government. They met with Barrow on Wednesday, May 7, over comments attributed to National Women’s Commission executive director, Ann-Marie Williams, suggesting that the Government is moving ahead with the new gender policy—despite calls from the church community for a revision. Pastor Scott Stirm of Belize Action, one of the leaders who attended that meeting and who says that the new gender policy is really “a social reconstruction policy,” told Amandala that Barrow gave his commitment that he would do no such thing. Barrow also indicated that he had checked with Williams about those comments, and she said she had not made the statements attributed to her. Following Wednesday’s meeting with the Prime Minister, Rev. 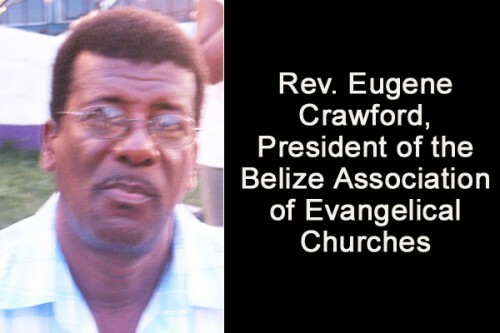 Eugene Crawford, President of the Belize Association of Evangelical Churches, reported that “The Prime Minister made clear that ‘remarks reportedly made suggesting the Government proposing to move ahead on the National Gender Policy without the Church are not factual’. The remarks, if made, do not reflect the position of the Government, and Government will not move to implement the National Gender Policy without seeking agreement with the Churches,” the statement added. Crawford said that Barrow had indicated to them that Government had also procured professional advice on the church’s submission on the gender policy. We asked Stirm whether Government has disclosed who is giving that professional advice, but he told us that the advisor was not identified to them and neither did they ask for the person’s identity. The association said that Barrow committed that he would soon convene a meeting between Government and the Churches to reach consensus for the final gender policy document. “That meeting is anticipated to happen by the end of July to allow time for Cabinet to analyze both submissions,” Crawford added. Stirm said that Barrow indicated to them that, as far as he is concerned, he suspended the gender policy, and nothing has been activated off the gender policy. Of note is that the churches were not formally consulted before the policy was tabled at Cabinet and endorsed by that body, which is the chief policy-making organ of Government. They came public with their opposition after the formal launch of the policy on May 16, 2013. The Belize National Teacher’s Union has also issued a statement against the policy, which will soon be subject to formal revision. “By July, [Barrow] should have a standing committee that he would chair and that would be between people from Government side and from the Church to be able to review and go through the church report and make whatever adjustments,” Stirm told us. In his Independence Day message last year, Barrow made comments which have been seen as a positive signal by the LGBT community. Barrow said that the Belize Constitution that affirms the supremacy of the Creator also affirms fundamental rights and the dignity for all. He said that there is “no logical inconsistency” between those different tenets of the Belize Constitution, and added that Government, the churches and the Belizean polity must find a way to uphold all the principles of that foundation document. “In July, we will actually see where the rubber hits the road,” Stirm commented to us today, adding that they are insisting that gender will be “locked down” as being male and female only—which is what the Prime Minister committed to them last year. Crawford accepted that the church had “dropped the ball” in not really being proactive in following up as duly as they should have. “So as much as the time has moved on, we stand to be blamed because we have, as we said, 70% of our population, and let’s say the entire Belize, knows about this and have been waiting for some response and we haven’t been giving timely responses or updates on what’s taking place,” he said.